I love putting French phrases into Google translator to see what I get. The super literal translation, messing around with the syntax, sometimes puts words in a slightly more poignant order and makes me take them more poetically. Take for instance this French starter recipe I found this week. Obviously, it is a lovely stack of pear/cheese/pear etc, but isn’t that title just begging for an ellipses? Are you already filling in the blank for what comes between the pear and the cheese? Literally? Metaphorically? I’ve been playing around with a magazine this week that is the French equivalence of Bon Appetit. It is called a table. I’ve learned so much translating recipes, making predictions about what I think is called for and then sometimes getting surprised. For example, many recipes call for 1 c. a café de ________ or 1 c. a soupe ____________. Even though it didn’t exactly make sense for the recipe I was fairly assured that I was going to be using a coffee infusion and some other sort of liquid solution. It turns out that the first one is a teaspoon and the second is a tablespoon. That’s all. Now, isn’t that surprising and nonintuitive? This recipe says almost everything with the photo. 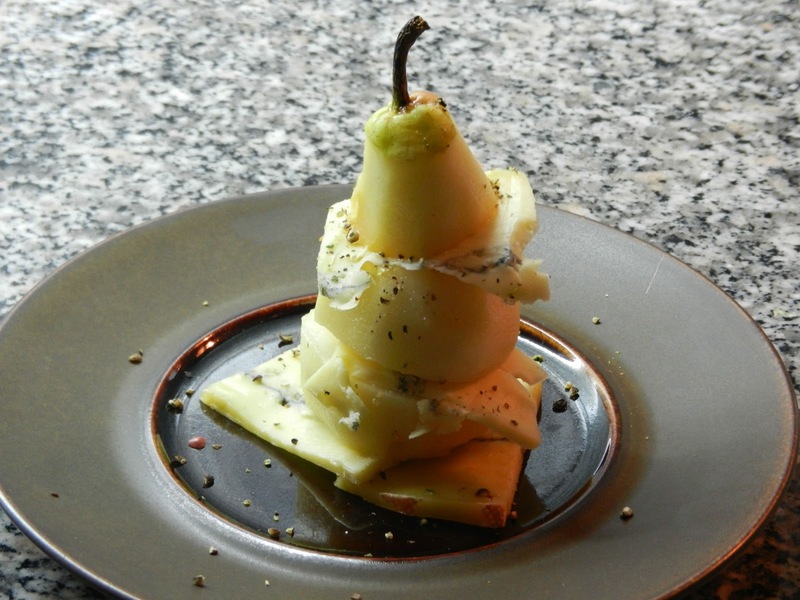 It is simply a strata of pear and cheese that has been sprinkled with lemon juice and dusted with a cracked pepper mixture. It comes together more deliciously than the short list of ingredients suggests. If you want to make it more substantial, place it on a bed of greens that have been tossed with olive oil and lemon juice, salt and pepper. For the full winter detox meal, follow the salad with a bowl of my favorite lentil soup. 1. Peel pears, leaving stem. Core them from below. Sprinkle all sides of pears with a few drops of lemon juice. Cut into 4 pieces each (see photo). If bottom doesn’t sit flat, trim it straight across. 2. Thinly slice the cheese, preparing about 5 slices per serving. Encourage some rough edges. 3. Arrange on a plate. 4. Sprinkle with cracked pepper. Love the musing, and knowing what is in your head as well as the recipe. I've never seen a pear as proud as this one. I can just tell this was delicious! Perfect for this time of year. Ha, proud pear… I love it. Such a calling. We're lucky that the pears are still nice.